It doesn’t look like I’ll be winning that week long stay in a luxury suite at the Hilton Union Square in San Francisco! I’m in close 2nd, only about 350 “likes” behind the 1st place person, ha haa! In the meantime, I thought I’d share a moment of crazy fun with you that helped lift my spirits! In case you couldn’t guess, I’m the crazy in the pink tutu! I may not be headed to San Francisco any time soon at the rate this contest is going but I AM still headed to EUROPE for two weeks in May so life is good, real good! I am blessed to be living and having fun! I have the opportunity to win a social media contest sponsored by Hilton Union Square in San Francisco! The past guest whose story is being currently featured on their Facebook page, has to have the most “likes” under their photo. Can you help a fellow blogger out!? I’m currently in close 2nd place with 65+ likes!! Food the link to the Hilton page featuring the picture of me and my friends in our Pj’s! Just click like and you are done ! So easy and it would make me so happy! I’ve been promising my 14 year old that I would take her to see KEANE next time they hit LA. We’ve been fans of this British band for a while & I have yet to miss them when they do play here. Paige was pretty excited to have a night out around the famous Hollywood & Vine area, which is where the beautiful Pantages Theatre is located. We ate at the bar of CLEO’S Restuarant, which is located inside the REDBURY HOTEL. Both were designed by photographer Matthew Rolston. I can’t wait to come back here with my husband for the full grown up night out experience! 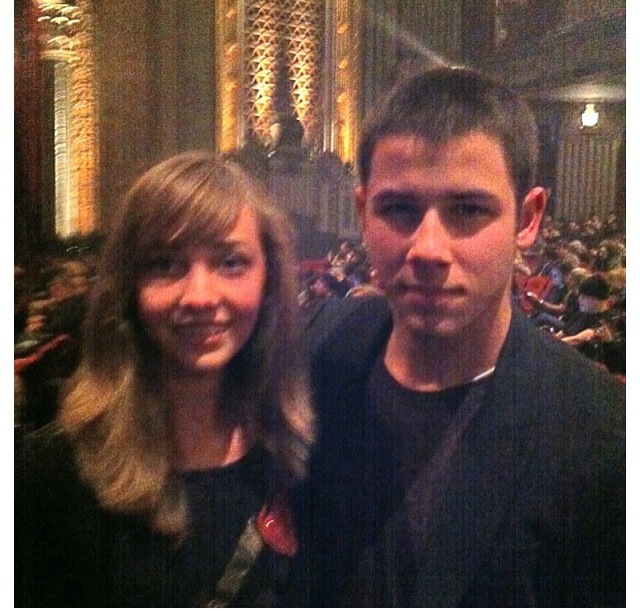 Not only was the time spent with my music-loving daughter fantastic, the concert was great as usual but the highlight of the evening for her was a run in with Nick Jonas of Jonas Brothers fame. He was sitting with a friend just 3 rows up from us. He was very kind to her & indulged her with this picture! I think she liked him even more after she realized he appreciated the sounds of KEANE! 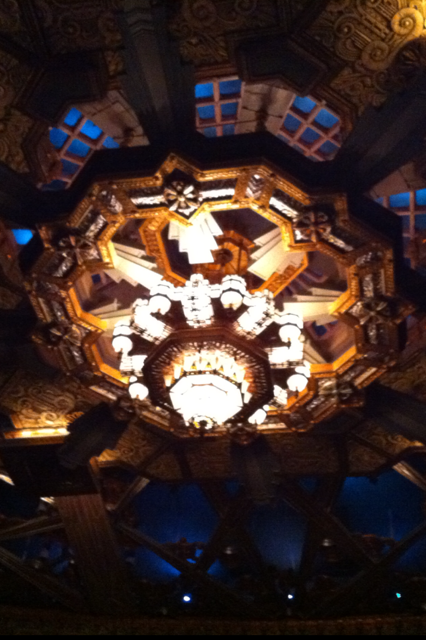 And if you ever get a chance to see a show inside the Pantages Theatre, go for it! The space is phenomenal! I love flowers & I love Gardens…indoor or outdoors! This is one of the best displays I’ve seen on the West Coast. This beautiful display is in the Bellagio Hotel Conservatory in Las Vegas. It’s on my daytime “day time to do” list each time I visit! It’s never the same display twice! They change the display through the seasons and also have exhibitions as well. When everything is moving so quickly in the fast paced city, it’s a real treat to step into the conservatory and feel the tranquility around you. 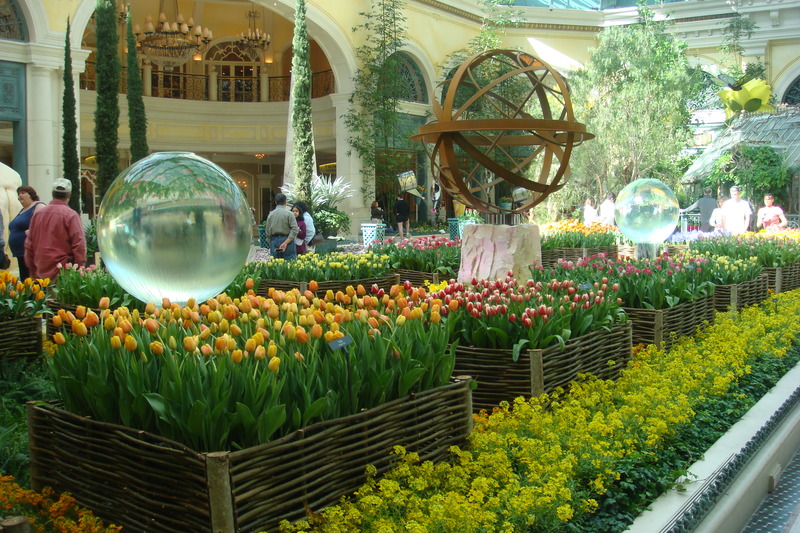 Click HERE for the Bellagio’s calendar of events for the conservatory. One of the best ways to see the lights of Vegas is from the top of the Eiffel Tower in front of the Paris Hotel. I like to time the visit with dusk so that you get the “FULL experience” of sunset over the mountain ranges combined with the lights. It’s also an amazing spot to watch the Bellagio dancing water fountain show, which is literally right beneath you. Click HERE for ticket prices, hours of operation, & information on everything offered at the Eiffel Tower Las Vegas! A hotel for your Pooch! As recently as a few decades ago, most dogs were “outside dogs”, and only the most privileged had dog houses in their yards. In recent years, not only have dogs made their way inside our homes, but most are now welcome in our beds, cars, laps, purses, and wherever else we can share our love together. And now, when you can’t be together with your dog, they are welcome to join our extended loving family of Pooch Hotels. In 2004, we had a vision: to create a dream destination for dogs, where people could feel good leaving their pooches, knowing they would be loved, pampered, and cared for. Pooch Chicago was born. By 2008, we had two locations in Chicago: Lincoln Park and West Loop. In 2009, we expanded to the Silicon Valley in Sunnyvale, California. Shortly thereafter, Pooch was elevated from a boutique, family-run organization to a brand worthy of national recognition and scale – it was purchased by Petco to recreate the fantastic Pooch experience in more areas across the country. We are a family of diverse experiences, backgrounds, and interests all brought together because of our love for animals. I LOVE this idea! I’ve only had to board a dog once & it felt like the pound, it was sterile, musty, and in no way resembled any form of fun. Pooch Hotel feels like a home and treats your dog as if it is a family member! Locations are popping up across the country. I’m excited that I have one nearby to try out! Pooch Hotel offers 1/2 day, full day, and multi day boarding so whatever your needs are, they can meet it! Click here to see their full site with a list of services, locations, and more about the company. Next time you travel and need a place for your four legged loved one, consider finding a Pooch Hotel near you! A few years ago, a good friend of mine was taken on quite a vacation by her in-laws. They invited their adult children, their spouses & grandchildren on an African Safari over Christmas time. They visited several countries, did a few safari’s, mingled with the Masi, & had the family vacation of a lifetime. The pictures she shared with me were truly amazing! 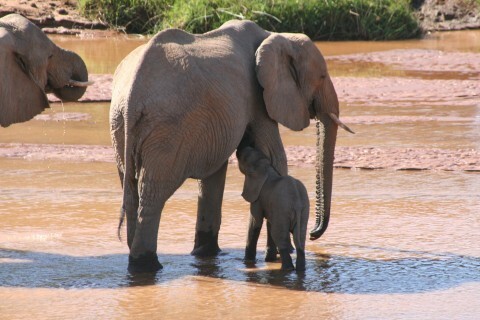 This is just one of many & was taken in Kenya. click here to see one of the lodges they stayed at. There are so many beautiful places to see on this planet & Africa is just one of many on my list! It’s prioritizing the list that brings me anxiety! How to choose what’s next is always when the boxing gloves come off at my house, the art of compromise comes into full play! Africa will have to wait a little longer since next year’s trip to celebrate our 25th wedding anniversary has been booked! We will be Europe bound, not quite as wild as seeing Elephants at play in their natural habitats but still full of culture & adventures for those seeking it. Is it too much to ask to have JUST ONE of these fabulous views!? All of tehse are beautiful but I wish the Maldvies were easier to get to! I just had to share ! great list from travel zoo! 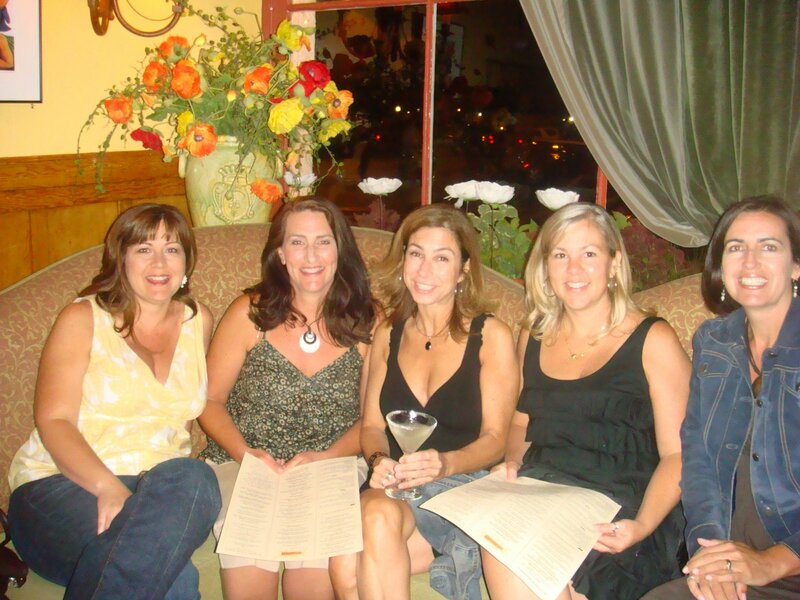 Sonoma is where it all began…our annual girl’s trip about 9 years ago. Each summer, my closest high school friends manage to carve out a small bit of time away from our families, jobs, and other life obligations to meet up. 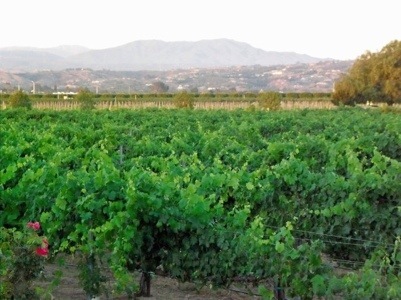 Our first trip to Sonoma was fun but to be truthful, none of us really knew much about wine! I was content with “Franzia in a box” ( I know, sinful!)! Aside from catching up with Karri, Lorri, Julie, and Dina, I was really excited to explore the wineries with a little bit more knoweldge under my belt! I KNOW what I like & I know what I DON’T like but I couldn’t tell you why! So, I don’t pretend to taste all the different fruits and spices within each taste but I can tell you I like one over another. So, I keep tasting until I can figure it out! Each trip, a different girl plans our lodging and this year was Julie’s turn. We were very impressed with our first glimpse of “The Lodge in Sonoma”. It did in fact look a lodge you would imagine at the edge of the woods. It had great flowers all around the property as well as gardens for their herbs and vegetables that they used in their restaurant. Our only initial disapointement was our first room, which was facing the busy street below and had street noise so the spacious balcony couldn’t be enjoyed. Not to worry though, Julie to the rescue! She quickly called the front desk and secured us a “Casita” in the back of the property! We scored! It was sooo quaint and much more roomy than the hotel style room we just gave up…this was our own little apartment with a ground patio space w/ just enough furniture for us 5 ladies to relax on. It was also within walking distanc to the pool, which is always important on a girls trip! Here are the girls enjoying some patio time before we head to the relaxing pool! As for the wine tasting, we hit quite a few but the most memorable was The Ledson Winery In Kenwood on Sonoma hwy. ( http://www.ledsonwinery.com/winery ). Not only was the property impeccable but the “castle” on the estate was breathtaking! The people were super friendly and the wine was the best that we tasted over the two days. We had such an enjoyable couple of days here in Sonoma & you really can’t go wrong no matter where you stay or where you taste, it’s all good!